Daniel Smith Watercolour Sticks a new, extremely versatile, true-multimedia artist tool Premium Art Brands Ltd.
DANIEL SMITH EXTRA FINE WATERCOLOUR STICKS are a new, extremely versatile, true-multimedia artist tool, putting the power of drawing and painting together in one unique tool! DANIEL SMITH EXTRA FINE WATERCOLOUR STICKS offer the same superior intensity as the DANIEL SMITH line of Extra Fine Watercolour paints with the convenience and portability of half pans. 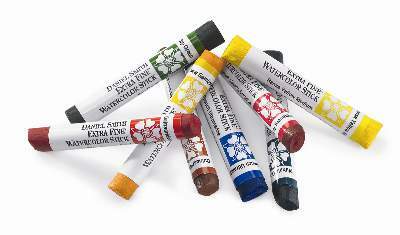 Each stick is packed with pure pigment and produces vibrant, strong colour when wet or use them dry to build texture. They’re highly reactive with water and release rich, creamy colours.